Ender’s Game had everything going for it, the story was taken from a very popular young adult novel (just like Harry Potter or The Hunger Games) and the cast is great (led by the perpetually grumpy Harrison Ford), but it just felt like there was something missing. Ender’s Game follows the journey of Ender Wiggin (Asa Butterfield). He is accepted into a school that trains kids to lead wars. Years ago, Earth was invaded by aliens and the ensuing fight left many dead and large parts of Earth were destroyed. Children are taught to combat these aliens in case they ever return. They are taught tactics and strategy, as well as training to fight. Ender is anointed by his Commander (Ford) as the next up and coming leader of the human army, he has a brilliant strategic mind, but needs to be accepted by his peers. This is made difficult because Ender is very shy, and also comes across as a bit arrogant sometimes. He is put in charge of a team of kids that have been unwanted by their former teams, and it is up to Ender to mould them into a coherent fighting force. This film is ok. I really enjoyed Harrison Ford as Commander Graff. He is delightfully grumpy, just as you’d expect a seasoned military leader to be. I thought the character of Ender was a bit lacking though. The previous successful adaptations of young adult novels have a protagonist we can relate too. We are ready to go on this journey with Harry Potter or Katniss Everdeen and the audience wants them to do well, but I never felt this way with Ender. I didn’t really care what happened to him. It is a shame because I really liked the cast, and the story is interesting, I just felt a bit let down by the main character. I thought he could have been more humble. Whenever Ender accomplishes a task set for him, you get the feeling he expected to do it from the start. I never felt that when watching Harry Potter or The Hunger Games. When Harry or Katniss accomplish something, you feel like they’ve just saved the world when nobody expected them too. In Ender’s Game, everybody expects Ender to be amazing and it is a bit of a letdown when he is. I had a bit of a problem with the fact they were training children to be warriors. It is never really explained why children are better to do this than adults or older teenagers. Ender could not be more than 10 or 11, I’m not sure why he’d be better to train to be a destroyer of worlds than someone a little bit older. In The Hunger Games, it is explained clearly why these kids are in the predicament that they’re in, and the audience accepts that. It is awful, but we accept it nonetheless. There is no explanation here as to why young children would be better leaders than anyone else. It didn’t make much sense to me. I’m wondering if the book contains more information about why kids were taught. I have read both The Hunger Games and Harry Potter and am sure I have picked up things from the books that the movie glosses over. It’s not all bad though, the effects are good in this film. I really enjoyed the combat training scenes set in a weightless room. The children hold games in there and these scenes are some of the more exciting in the film. I thought this film was just average. An unappealing lead character cannot be saved by a solid cast and top notch special effects. I think I’m burnt out on young adult dystopian future movies. Ever since The Hunger Games this has become the “it” genre, and I’ve burned my way through the pages of multiple books detailing the lives of teens fighting oppressive governments, outrunning alien creatures, and fighting to survive the elements. But as with most books, the film adaptations are rarely as good. What’s worse is that the oversaturation of these mediocre flicks will likely lead readers away from some truly excellent books. Full disclosure: I have not read Ender’s Game. I hear it’s great though. I can guess from this movie that it is filled with some complex themes that make for great reading. However, I wonder if it’s really meant to remain on the page. The film is good, but something is lacking. I can’t put my finger on what exactly, because it seems to have everything going for it. The cast of Ender’s Game is excellent, mixing veteran actors with bright newcomers who are able to hold their own on screen. 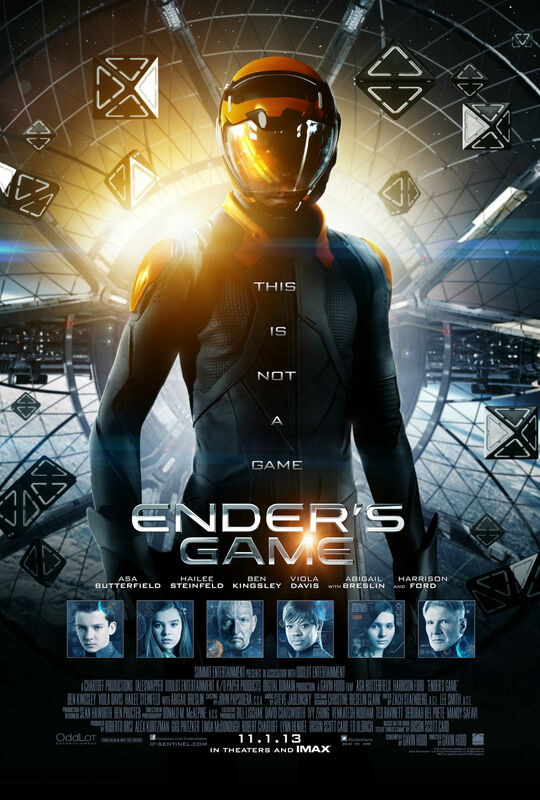 Asa Butterfield stars as Ender Wiggin, a boy chosen to lead an army against aliens who had previously attacked Earth. Butterfield is great as Ender and ably performs opposite actors with much more experience, notably Harrison Ford and Ben Kingsley. His best friend, played by Hailee Steinfeld, is another great addition to the younger cast. I wish she had featured more, because I feel her talents were underused. Ender’s Game is full of special effects which are well done. Some of my favorite scenes are during the kids’ training in the Battle Room, a glass sphere where they play extreme laser tag games in zero gravity. If this was a real thing I’d totally be into it. At the same time the movie doesn’t rely too much on CGI. There appear to be mostly practical sets used, which I always appreciate. I’d rather see real sets enhanced with CGI than heavy use of green screen. The story itself is compelling, with thought provoking themes centering on the justification of violence, political secrecy, and morality. Unfortunately the run time of a movie is too short to properly delve into any of these issues. They’re all touched upon, but never fully discussed in a meaningful way. Part of the problem is that the ending feels rushed. As soon as Ender learns the error of his ways the film ends. We’re only given a glimpse into his remorse and a hint at how he intends to right his wrongs. I suppose this is where a sequel would pick up, but the possibility of one being made is slim. I liked Ender’s Game, I just can’t say I loved it. While I intend on reading the novel someday on the recommendation of some friends and family members, the movie itself doesn’t compel me to pick up the book. It doesn’t even compel me to watch any future sequels should they be made.